Chicken House is a new point and click physics based puzzle game on bored. 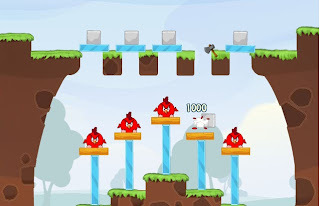 Solve 30 challenging puzzles with angry chickens in the house and 3 bonus stages when you play at author's site. Your objective is to pop the chickens with as few actions as possible. Take note the color of the chickens - blue ones only burst upon falling while red ones will only pop when an object hits them. After completing a level, you will be shown a star rating which determines how well you solve that level - three star being the highest rating. Anyways, some levels in this game are so difficult to beat with a three star ratin and the solution button in the game only brings you to a private video which can only be viewed with permission. It may only be temporary though. So whilst we wait for a Chicken House walkthrough to be available, here is short clip of the game we have found showing the first few levels.